The University of Miami Archives holds over half a million photographs, negatives and slides that document the University's growth from the 1920s through the 1970s. The 1960s was a decade of countercultural and social revolution. The changing mood of the times as well as the corresponding activities of students is revealed in the rich collection of UM's historical images. The 1960s was the decade of counterculture and social revolution. College students were active in anti-war and civil rights activities, and the University of Miami's students were also a part of this global movement. Female students under 23 years of age were required to live in 730 East and Mahoney residence halls. Male students under 21 were required to live in Eaton Hall. Curfews were mandatory for female students and dress codes existed for both sexes. Four students talking in a dormitory room, 1964. A student typing in her Eaton Residence Hall room, 1966. Students in a dormitory common room, 1962. The Associated Women Students was the governing body of all women students of the university. The purpose of the organization was to promote the best interests of the individual woman student and of the University, to provide social and cultural advantages for the students, and to report, administer, and enforce matters related to the behavior of the women students which were not otherwise delegated to the Dean of Women. There is a long tradition of cheerleading since the founding of the university. With five National Championships in football and countless appearances in UM sports games and events, the cheerleaders have been a vital part of the athletic program. Founded by UM choir director Glenn Wright Draper in 1960, the group gained nationwide popularity by participating in USO (United Service Organizations) tours, performing on the Ed Sullivan and Jackie Gleason shows, and appearing before a large number of local audiences. The ROTC (Reserve Officers Training Corps) organization exists to provide training to those students wishing to combine academic experience and military service. The program offers generous scholarships while helping students develop management skills and leadership roles. An intramural sports program was offered in order to promote wellness among students. The University Archives holds a large collection of historical images of UM students engaging in intramural sports from badminton to wrestling. UM received a half a million dollar grant from the Joseph P. Kennedy, Jr. Foundation for construction and support of a new Child Development Center. The grant was presented by Senator Edward M. Kennedy, president of the organization, and Mrs. Eunice Shriver, vice-president. In order to improve communication with students, President Stanford went to the "Rock" located in front of the Whitten Student Union for open discussion and debate with the students on Friday afternoons. He designed the space as a free speech area on campus. A baton twirler marches during a football game between the University of Miami and Florida State University at the Orange Bowl on October 15, 1962. Exiled Cuban physicians graduate from a refresher course in medicine designed to aid them in passing an examination for U.S. certification. The ceremony was held at Beaumont Lecture Hall in the Memorial Classroom Building in 1963. Presidents Jay F.W. Pearson (on left) and Dr. Henry King Stanford (on right) appear together as Dr. Stanford takes over the leadership of the University in July 1962. The Sixties Prepared for the Departments of English and History, University of Miami, by the University of Miami Library. The exhibition "Student Life in 1960s" was held at Richter Library's lobby throughout November 2010 and it was curated by Koichi Tasa, University Archivist. 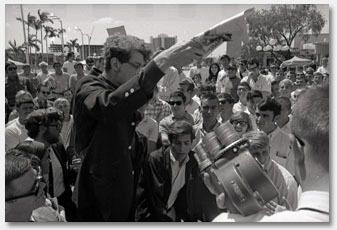 The images were taken from the University of Miami Historical Photograph Collection managed by the University Archives. The online version of the exhibition was created by Lyn MacCorkle, Repositories Development Librarian.